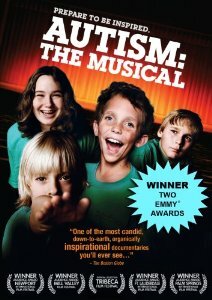 Autism- The Musical DVD by Elain Hall. This DVD follows the extraordinary and innovative acting coach Elaine Hall, five autistic children, and their parents as they improbably, heroically mount a full-length original stage production. Through trial and error, tears and laughter, these incredible families learn to communicate their feelings in song and performance, finding solace and joy in the act of creating. This entry was posted in Other/Miscellaneous, Our Library and tagged Autism Spectrum Disorder, Communication, DVD. Bookmark the permalink.